It took seven games and 16 at-bats, but David Dahl could finally breathe a sigh of relief. At the same time, Mike Tauchman may have had the air sucked out of his chest just a little. With a swing on a 84-mph changeup over the heart of the plate, Dahl smoked Ryan Atkinson‘s offering over the center field fence at Salt River Fields at Talking Stick for his first hit of the 2018 Cactus League. The hit was a long time coming for the left-handed-hitting outfielder who owns one significant Major League Baseball record for batting, yet did not record a big-league hit in 2017 and was looking like his first hit in Spring Training might never come. Dahl burst onto the MLB scene in July 2016, tying Cincinnati’s Chuck Aleno (1941) for the most consecutive games with a hit to start a major-league career with 17. He finished his rookie season with an impressive .315 average over 222 at-bats, compiling 23 extra-base hits and 24 RBI. The next great Colorado Rockies outfielder was ready to knock down the door to Coors Field, it seemed. But in Spring Training 2017 an all-too familiar situation surfaced for Dahl, who had not yet turned 23. A rib injury, which turned into a back injury, derailed nearly all of his follow-up campaign to his outstanding rookie season. Dahl made just 77 at-bats last year — none at the major-league level — as he attempted to overcome a third major injury in five years. In 2013 it was a hamstring. In 2015 it was a lacerated spleen. In 2017, the stress fracture in his rib and the resulting back spasms. Based on his even/odd injury schedule, 2018 was supposed to be a good year for Dahl. He returned to Scottsdale healthy and ready to pick up where he left off with the big club at the end of 2016 and chomping at the bit to re-join a roster that had reached the playoffs in 2017. But an 0-for-15 slump to start Cactus League play wasn’t how things were supposed to go. Meanwhile, Tauchman, another left-handed-hitting outfielder, had been going about his business with good success this spring. Tauchman was 5-for-15 entering Friday’s game against the Arizona Diamondbacks, including a home run and a triple. He added another hit and took a base on balls in the Rockies’ 15-6 victory, scoring twice. It has been a solid start to the spring for the 27-year-old who is still looking to catch on with the big-league club full-time despite a career .301 average in the minors. Tauchman finally broke through to the majors last year, appearing in 31 games for the Rockies. He compiled six hits, including a triple, and two RBI in his 27 at bats — a .222 average. He struck out 10 times in 32 trips to the plate. Not the meteoric start Dahl experienced, but nothing to be ashamed of. Through that many at-bats in 2016, Dahl was hitting .370 with a pair of home runs and a double, though. He was just 10 games into that MLB-record 17-game hitting streak. And he was just 22 years old at the time. Through the first week of Cactus League play in 2018, it appeared that Dahl might not yet be ready to return to the big club. The home run Friday, and a sharp RBI single in his next at-bat, assuaged some of those concerns. They also make life that much harder for Tauchman. 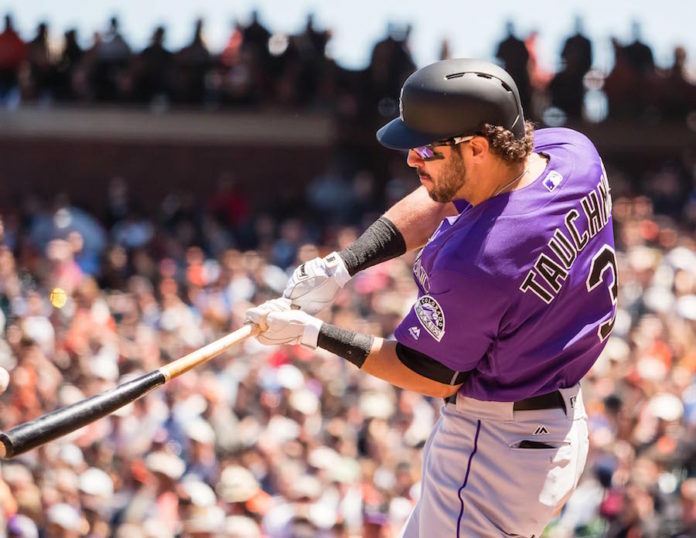 Tauchman and Dahl, together, create a bit of a quandary for the Colorado Rockies. With so much in common (power-hitting lefties who can play any outfield position), both have been fighting a logjam in the outfield at the big league level, while fighting personal battles to boot. Dahl with his injuries. Tauchman the long, slow grind through the minors. Each one has shown breakout potential. Dahl became a Rockies darling with that superb start to his major league career. 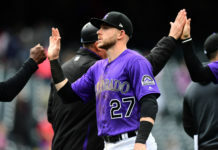 His .307 combined average in the minors, plus his 802 total bases in 386 games, suggest he could be the long-term replacement for Charlie Blackmon should the Rockies be forced to part ways with their All-Star centerfielder, either by trade or free agency at the end of the 2018 season, because they simply cannot afford to pay both Blackmon and franchise cornerstone Nolan Arenado in the years to come. But Tauchman, too, has the potential to take over that (or any) outfield spot should Blackmon depart. He doesn’t have the career power numbers in the minors as Dahl (fewer bases in 108 more games, less than half as many home runs in nearly 300 more at-bats). Yet, 2017 was a big year in Triple-A Albuquerque where he hit .331 and more than doubled his minor-league home run total with 16 for the Isotopes. Both are fighting Raimel Tapia for Bud Black‘s fourth outfielder roster spot in 2018. Tapia brings his own intriguing flair to the competition. A speedy, rangy left-hander that looks the part of a prototypical leadoff hitter. Tapia has nearly 200 MLB at-bats to his name from 2016 and ’17, and won’t be easily giving up his claim to that final spot on the big-league club. He’s hitting .286 with three extra-base hits through the early part of Spring Training this year. Fans flock to Tapia because of his curly, bright blond hair, wild running style, and electric smile. But despite his big personality and blazing speed, Tapia still lacks the base-stealing ability and defensive consistency that would earn him the job. Dahl inured himself to the Rockies’ faithful with that monster start of his pro career. His health has proved to be his biggest enemy in his journey to a full-time major league roster spot. Tauchman, meanwhile, has flown mostly under the radar compared to those two. Yet, he has done more than enough to be in the mix for the Opening Day roster in 2018. Black is expected to keep just four position players on his bench to start 2018. A utility infielder (Pat Valaika), a backup catcher (Tony Wolters), a backup outfielder (Dahl, Tauchman or Tapia), and one more utility position for a versatile infield/outfield type. Dahl, if healthy, entered Spring Training as the presumed leader in the chase for that outfield spot. That’s what a MLB-record hitting streak and .315 average in your rookie season will do for you. But his rocky start to 2018 began raising serious doubts about that. The home run and RBI single on Friday might be just what he needs to kickstart things. Tauchman, meanwhile, now has to shine all the brighter to overshadow Dahl. That’s the nature of life on the fringe of a MLB roster, where one game and two at-bats can swing the conversation.